Jake Delhomme is another storied member of the WLAF/NFLE to make it good, again further proving to me that the league was succeeding in its mandate to create better talent for the NFL. Names such as: Kurt Warner, Jon Kitna, Quinn Gray, and Kelly Holcomb joined Delhomme in the ‘developmental league’ to further their talents in the sport and then return stateside to take the league by storm. Jake played for the University of Louisiana – Lafayette, from 1993 to 1996. There he’d etch his name into virtually all of the school’s passing record books finishing as the Ragin’ Cajuns all time leading passer in touchdowns and yards. Delhomme did not get drafted, however the New Orleans Saints offered him a free agent contract and he joined their developmental squad in 1997. Jake was assigned to the Amsterdam Admirals of the NFLE that next season where he was able to polish his skills a bit more. In his first season under center for the Admirals, Jake backed up future MVP Kurt Warner. 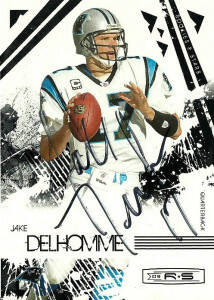 His debut was unspectacular to say the least as Delhomme posted a 15.1 QB rating that season. Returning to the league for 1999, Delhomme put it all together in a solid effort. This time Jake was assigned to the Frankfurt Galaxy. He, alongside Pat Barnes provided a 2- headed monster quarterback option that the rest of the league couldn’t handle. Jake in fact finished second in the league with a 96.8 QB rating, throwing only 5 picks to 12 TDs. The Galaxy went on to win World Bowl VII 38-24. In the game, Jake finished 9 of 14 for 126 yards and a touchdown to Mario Bailey. Delhomme has always maintained that it was a team effort that resulted in the Galaxy’s World Bowl win. The bottom line is the stats didn’t lie, and both he and Pat Barnes’ numbers on the season were almost identical. New Orleans liked him enough that year to bring him back again in 1999. The team was suffering badly with injuries to the quarterback position and a revolving door at the position appeared with Billy Joe Hobert, Billy Joe Tolliver, Danny Weurffel, and Jake sharing time at quarterback during the tumultuous season. With only Ricky Williams on offense, the team struggled mightily, but Jake got his first start against the Dallas Cowboys in Week 16. He didn’t disappoint as he led the team to only its 3rd win of the season 31-24. I remember the game vividly, as I had watched football only casually in those ‘dead years’ after the Oilers left Houston, and secretly rooted for the Saints since I hated the Cowboys with such vitriol. While Jake did not see significant playing time over the next few seasons, buried on the depth chart behind Aaron Brooks and Jeff Blake, he did manage to hang on through an offensive overhaul and a new coach. Finally in 2003 Jake finally got the break he was looking for. 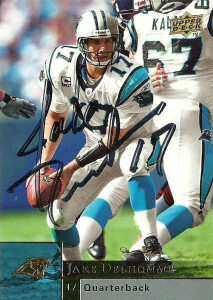 Delhomme signed with the hapless Panthers, a team with a new coach going in a new direction after a 1-15 season. Feeling that he was the right quarterback, at the right price, since there would be no rookies available for the Panthers that they’d like, Coach John Fox took a shot at Jake to compete against aging Rodney Peete. Fox wouldn’t be disappointed, and by the end of the first game of the 2003 season, the Panthers would have their anointed starter at quarterback. Jake turned a new chapter in his NFL career and blossomed into a bona fide starter at the position stringing together an impressive resume of games and statistics, helping the Panthers out of the doldrums of the NFC South. Without question, he was the free agent signee of the year, leading the improbable Panthers all the way to the SuperBowl, putting together one of the best big game performances in history, only to fall short of the Patriots by a field goal. 2004 proved to be career highs for Jake in most passer categories, but the team stunk, -stung by the injury bug. This season was notable, as I was in the fantasy football playoffs, but all my starters were not playing, so I cut and benched them all, and signed Jake as my starting quarterback and rode my way to an improbable league championship under his wing. The Panthers again returned to playoff form in 2005, as Jake continued to rewrite the franchise’s record books. Injuries to his thumb kept him out of 3 games that season, and in 2006 an elbow injury basically wiped his season out. In 2008 Delhomme returned to form with a vengeance, guiding the Panthers to their best record in franchise history, but his interception numbers began creeping up on him, and after a disastrous playoff performance in which he threw 4 picks, fans were clamoring at the gates for the end of his tenure. The same story repeated itself for Jake in 2009, as he threw 18 interceptions to only 8 touchdowns. The writing was on the wall after the season, and the Panthers’ career leading passer was unceremoniously cut. In the journeyman phase of Delhomme’s career he went to Cleveland in 2010, and tried to help restart the fortunes of the beleaguered franchise, but again, injuries beset Delhomme. This time he suffered a nagging high ankle sprain which plagued him all season. After his one season for the Browns, Jake was cut again. It wasn’t until late in 2011 that Jake was signed, appearing on the radar of the Houston Texans. With injuries hitting the Texans at quarterback, 3rd stringer TJ Yates needed competent and experienced teachers and quarterbacks behind him. In came Jake Delhomme and Jeff Garcia. It’d be for the Texans, after Yates suffered a bruised shoulder in the season finale, that Jake got his final playing time, leading a heroic comeback for the Houston Texans against their arch rival Tennessee Titans. While the Titans ended up winning the game, the Texans made the playoffs for the first time in franchise history, nonetheless. After the season and the Texans first playoff victory and loss, Jake has retired back to Louisiana. I tried on multiple occasions to get Jake’s autograph and completely failed. The first time was an RTS from North Carolina, that led me to Ohio from a tip I was given. It never panned out, but after seeing that he had returned to his roots in Louisiana, I thought this was my best shot. Luckily I finally landed Jake on the third try on these 4 great cards. All of them showcase great design and an excellent action shot of him and oddly just happen to be all 2009 releases.